Happy new year, happy New Universe! In this episode, space-cases Chris (@AceComics) and Reggie (@reggiereggie) investigate the prolific and controversial life of one-time Marvel Comics Editor-in-Chief Jim Shooter, when they read Star Brand #1 from 1986! There's a bio on penciller John Romita, Jr., and a bit of information on the rise and fall of Marvel's New Universe, but much of the episode is given over to Jim Shooter--his accomplishments, his failures, and his editorial philosophy! All of this culminates in some off-the-cuff ruminations and some listener mail. Enjoy! EVERYONE HAVE A HAPPY AND HEALTHY NEW YEAR! Here it is, the final "Real Comics History" re-upload... in which we discuss 1962. If you've enjoyed these episodes please let us know and we will try and make them a more regular feature! Thanks! Subscribe to the show on iTunes, Stitcher, Google Play... wherever's most convenient! New episodes of Chris and Reggie's Cosmic Treadmill drop every Sunday morning. Weird Comics History releases sporadically on Tuesdays. Re-uploads of "classic" episodes hit every Thursday morning (at least until we run out of 'em!)... which, we just might have! Happy holidays and season's greetings, everyone! In this episode, our resident grinches Chris (@AceComics) and Reggie (@reggiereggie) shake their bellies like bowls full of jelly and get infused with the Christmas spirit when they read DC Comics' Christmas With the Superheroes #1 from 1988! After what they'd hoped would be truncated biographies for every creator on every story in this anthology, our comic book elves read through the entire issue in their impeccable squawky style. If you miss this particular hit of eggnog, you'll be placed on the Naughty List! From Chris and Reggie, everyone have a happy and safe holiday! Thanks to everyone for listening! 1954... a year that changed comics forever! Join Chris (@acecomics) and Reggie (@reggiereggie) as they give a quick and dirty reminiscence of their five-part Weird Comics History series on the Comics Code Authority (Episodes 1-5, available in the archives!)... and chat up a bunch of other (less-noteworthy) comics biz events of the year. There's also some at-the-time relevant Young Animal news (at 22:35)... which you're free to ignore! Step into our budoir, comics enthusiasts. In this sinfully sultry episode. 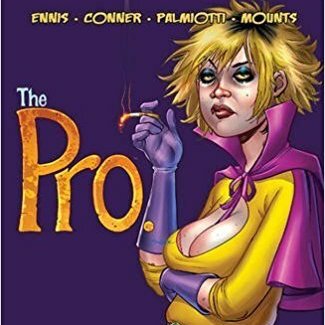 Chris (@AceComics) and Reggie (@reggiereggie) delve into the "bluer" side of funnybooks when they read Garth Ennis, Amanda Conner, and Jimmy Palmiotti's prestige format The Pro. published by Image Comics in 2002! After some squeaky clean creator bios, and a downright pleasant review of the conditions at Image Comics that made this comic book possible, our intrepid but tepid explorers spelunk the seedy and slightly sticky pages of The Pro., with some dialogue altered to preserve decency. After revealing some thoughts on the book, there's a list of times characters did the nasty in mainstream comic books. It's an episode that will put your partner in the mood...to leave the room! C'mon get happy everybody! For this week's "classic" re-upload, flower children Reggie (@reggiereggie) and Chris (@acecomics) discuss the year in comics... 1968! This isn't so much an "according to them" sorta show, considering that neither of the fellas had yet graced the planet with their presence... however, with the benefit of hindsight (and the internet) they break down all the big news in the comics biz. What better way to prepare for this weekend's milestone 69th episode than discussing a year ending in 68? Well, there's probably many better ways, but this is all we got! Hell...o, living comics enthusiasts! This week, our wicked hosts Chris (@AceComics) and Reggie (@reggiereggie) look at the last of four launch titles when Image Comics opened for business in 1992: superstar artist Todd McFarlane's Spawn #1! After some author information, it's right into dissecting the issue, and the origin story for this rather...familiar character. Then, they talk about some of Todd's controversial public statements before closing out with a look at Todd the Toy Master, and a brief history of playtime! Plus: listener mail! You won't want to miss it! Welcome to the final "classic" Cosmic Treadmill, and what an episode to end on... Sugar & Spike. Please enjoy an hour of baby talk... some of which actually comes from babies! Greetings, comics enthusiasts! Our erstwhile heroes Chris (@AceComics) and Reggie (@reggiereggie) dive into an unusal iteration of a unorthodox superhero team, when they read J.M DeMatteis and Alan Kupperberg's The New Defenders #126 from 1983! After the requisite author bios, they detail the history of the Defenders to 1983, then dissect the issue in their inimitable way. Then, more about the Defenders (including something about a Netflix show) and a list of radio, television and movie adaptations of comics that eventually informed the source material! It's going to be balls-to-the-wall, bickering action, so don't miss it! Thanks to Joe Crawford for the suggestion!